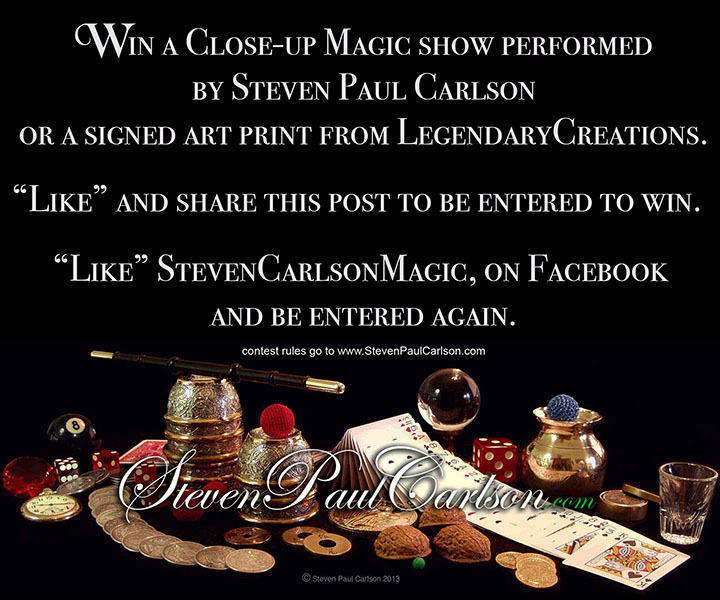 This contest drawing is for the prize of one complimentary 20 minute close-up magic performance by Steven Paul Carlson, or one of his signed limited edition art prints. Courtesy of StevenPaulCarlson.com and LegendaryCreations.com. The Magic show proximity is limited to within the Twin Cities Metro area. A winner outside of this area is eligible to chose from one of Steven Paul Carlson’s signed art prints shown on LegendaryCreations.com Maximum print value $60.00. Shipping is free in the continental US. Judges decision is final. Prize must be redeemed by December 1st 2017. No cash value for the prize. Void where prohibited by law. Batteries not included.